Archibald Finalist entry first study Smoke and Mirrors. 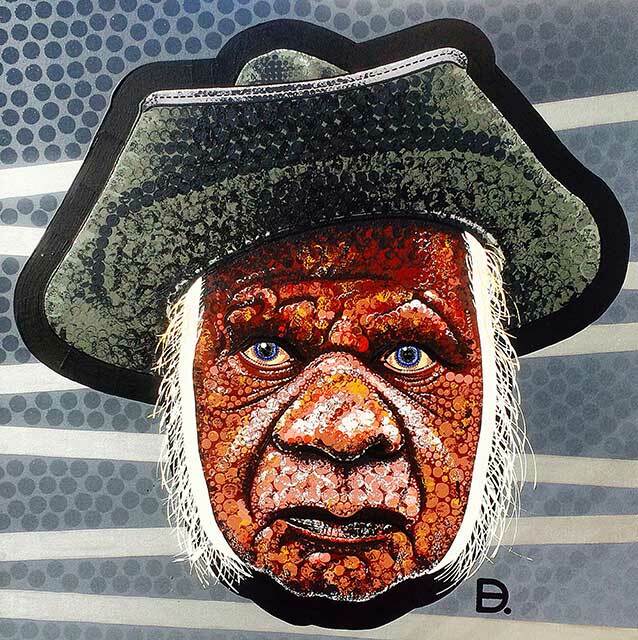 Adam (aka Blak Douglas) Hill talked about the subject of his entry, Uncle Max Eulo as having, "...etched his way into modern Sydney Aboriginal culture somewhat enigmatically. "I recall seeing him for the first time, a decade ago at a launch in Ashfield. His introductory catch phrase was, 'My name's Uncle Max Eulo and I'm from Bourke... where the Crows fly backwards'. Thereafter, I've seen Uncle Max at most Indigenous events, cleansing the scene with his coolamon and smoking gum leaves. "I thought this lovely man should be portrayed not only because of his prepossessing face but the fact that he has become one of the most recognised artistic celebrities within the performative public arena. Where there’s smoke, there’s Uncle Max". The sale of this work includes the proviso that the Artist can loan the piece for a designated exhibition planned.